The Most Rugged, Wear Resistant Gear Pumps in the world. Designed to survive the severe challenge of liquids containing abrasives, the Gorman Rupp GHA Series Extreme Duty Rotary Gear Pumps combine proven gear pump technology with state-of-the-art wear resistance processes, making it the world’s toughest, longest lasting gear pump. 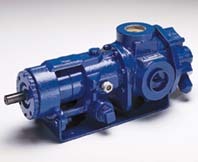 Available in cast iron with capacities to 146 GPM, pressures to 200 PSSI and viscosities to 250,000 SSU, the extreme duty gear pump offers many of the performance features found on all G Series Rotary Gear pumps, as well as innovative and unique abrasion-resistant features that provide the best service life possible under many extreme wear applications. The Gorman-Rupp GHA Series™ line of positive displacement Rotary Gear Pumps is designed to provide performance no other gear pumps can match. G Series Rotary Gear Pumps are manufactured with patented features that enable them to perform better and last longer on countless applications, providing quality and reliability that makes the G Series Rotary Gear Pumps the premier gear pump in the industry.